Looks Good from the Back: Vintage Banana Republic. Better and Better. 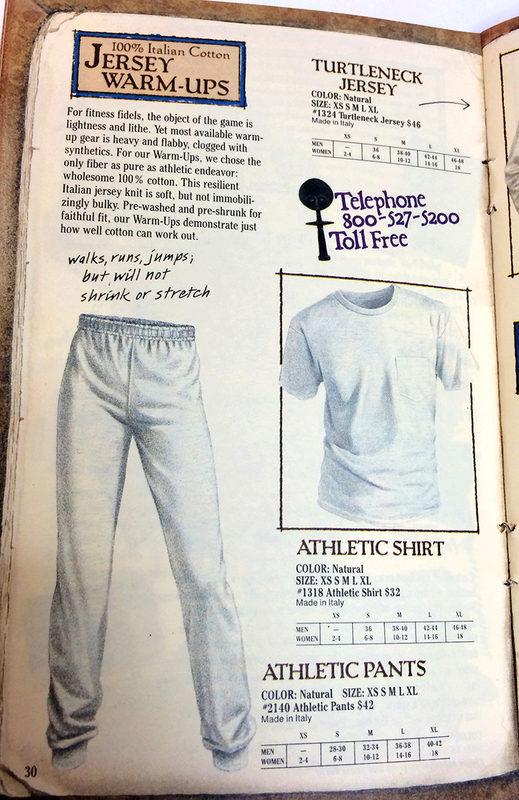 A: $46 for saggy cotton sweatpants? IN THE 80s? Lululemon could take a few lessons from this. M: Wait, is this Normcore? A: Super plain white cotton t-shirt? $32! Did I mention it's cotton? Did I also mention it's 1988 and we're going on safari? M: These sweatpants are just the thing for outrunning lions! 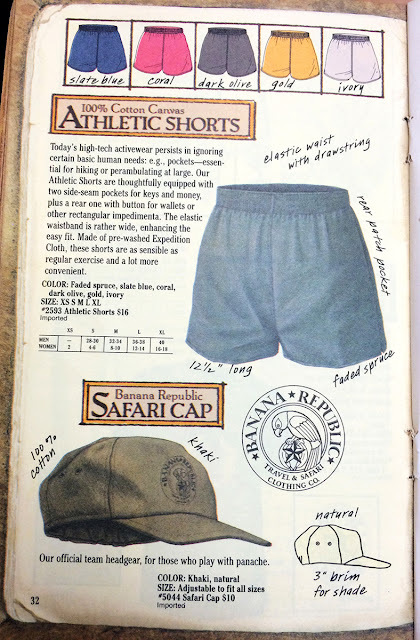 A: Nothing says authentic like a safari cap and elastic waisted gym shorts. M: Watch it, that's the official team headgear. Something tells me these people are not the sporty type. A: Maybe you don't have your elastic waist hitched up high enough? M: Go team! Hit a touchdown! A: Play with panache! dunk a home run! M: I'M GOING TO DISNEYWORLD! Good thing I held on to my sweatpants. A: Well, and thank god they're "not immobilizingly bulky." That's some faint praise right there. M: If your sweatpants are keeping you from moving I think you're doing something wrong. A: No, no, Marianne. They're NOT immobilizing. They don't claim they aren't bulky, just that you'll still be able to walk. M: I'm talking about all those other sweatpants. A: Oh, you mean non-safari sweatpants? We don't talk about that. M: WHY CANT I MOVE? A: It's not like you weren't warned. Hold up, hold up: Are they tryna tell me those shorts are made of CANVAS? Can this be real life? Which is better for crossfit I wonder? Canvas shorts with pockets or non-immobilizing sweats?